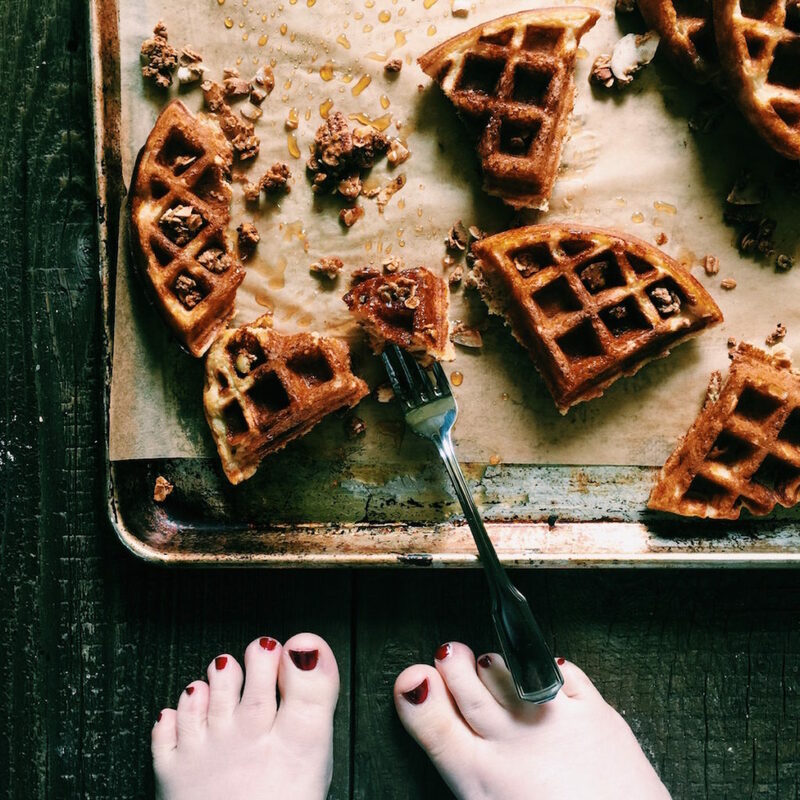 I waited a wee bit to post this granola waffles recipe because I was on such a chai granola bender several weeks back, I thought we needed a time out. A brief respite to build up the anticipation again. So I paused. Regrouped. Re-tasted several thousand times (expanded my legging collection) and decided that, yes, yes indeed. You can’t live without this recipe. 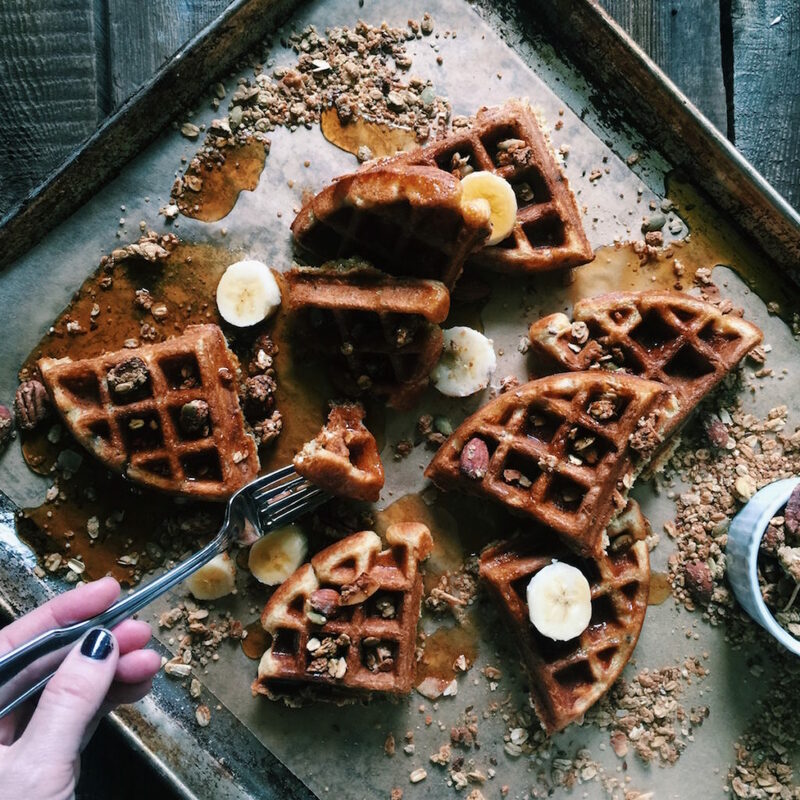 I highly recommend that you make my chai-spiced granola as it adds the perfect amount of spice, crunch and personality to these granola waffles. 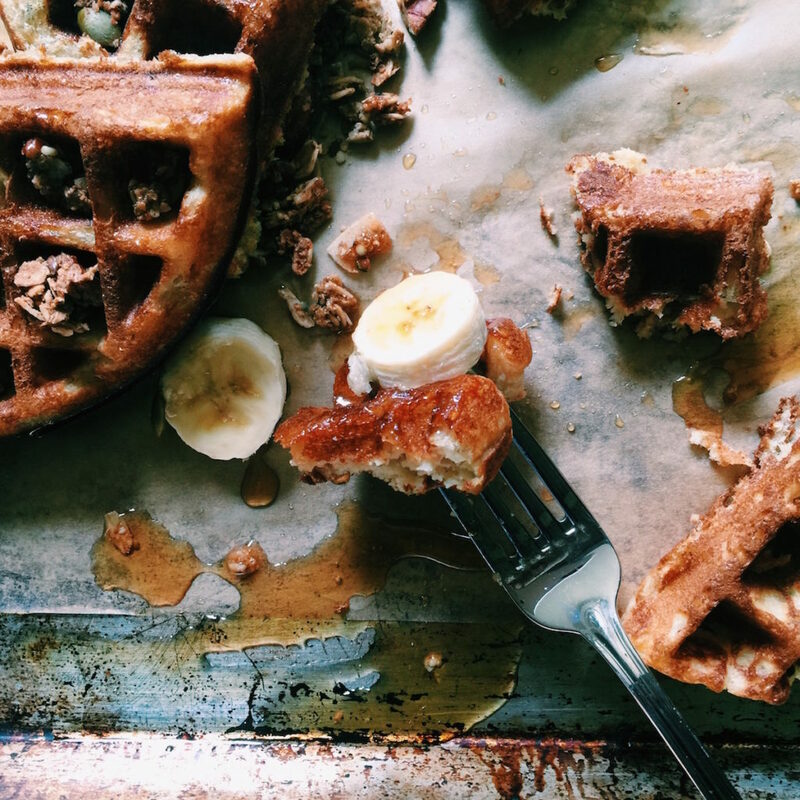 The granola is added first to the waffle batter for texture and flavor. Then once your waffles are hot and crispy, we sprinkle granola on top, along with sliced bananas (my preference) and then with a heavy-hand we drizzle real maple syrup all over the place like a ten-year old. This was one of those oh-my-god experiences when I first tasted them. Seriously out-of-body. The flavor. The texture. It was reminiscent of a sticky bun, with less denseness and more jazz hands…and zero yeast. Count me in. I was inspired by the Granola Waffle recipe in the Hot Bread Kitchen cookbook (highly recommend this cookbook if you like to bake bread). I thought it was genius. I had just made chai-spiced granola (inspired by Amisha at The Jam Lab) and thought, perfect, let’s do this. It was better than perfect. It elevates waffles beyond their already magnificent self. 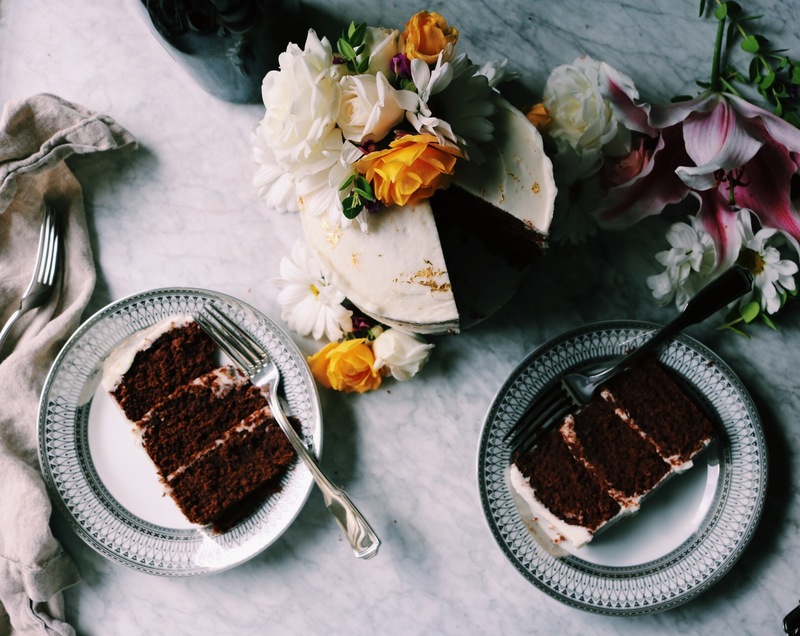 When brown butter hit the scene, it was all over. I had a new breakfast lover. Move over scones. 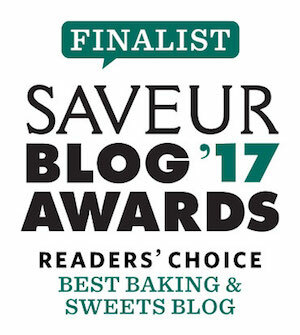 A Note on Flours. So, yes, here we are again with two flours for one breakfast treat. Here’s why: All-purpose flour I can count on for great texture and structure, but it lacks real flavor…which is why I throw in the white whole-wheat flour. It’s not for health…don’t be silly…it’s all for flavor. Try it…I think I’ll convert you. Also, don’t think that white whole-wheat and whole-wheat flour behave the same. They don’t. The latter is incredibly denser. The white whole-wheat imparts some flavor, as well as makes things fluffy. Yes, we like this in waffles. Granola. 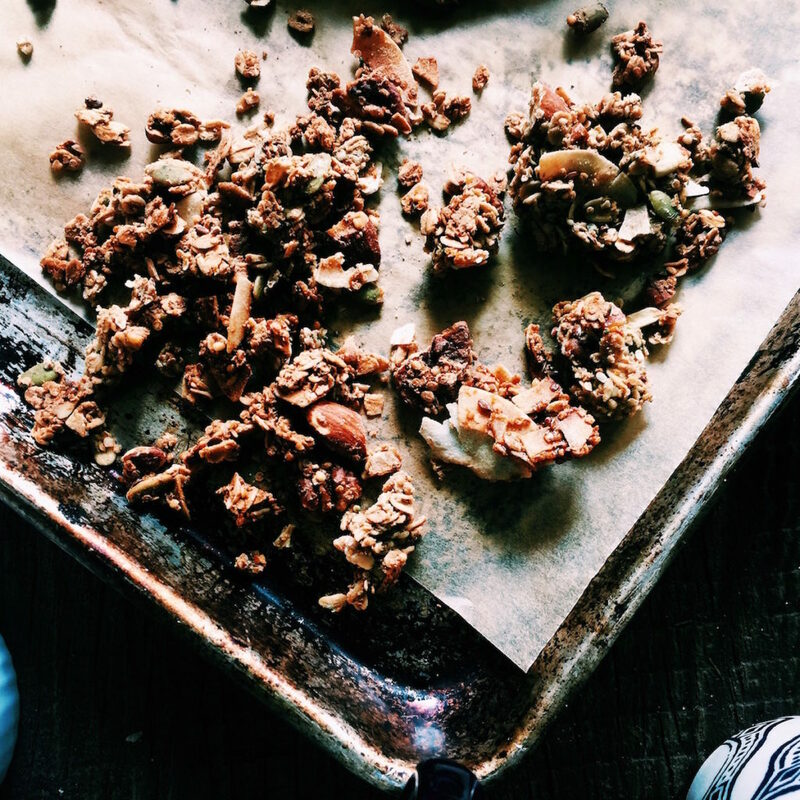 When I had you make the Chai Granola Cookies several weeks back I told you not to stress on making the granola…use whatever granola you can find. I didn’t want to stress you out. But, I think with these, you have to make the granola. They sculpt the entire tone of the waffle. Plus, granola is easy to make. You can do this. Maple Syrup. Go for the real stuff. No exceptions. Brown Butter. Brown butter and chai go together like peanut butter and jelly. There is simply no denying their chemistry. Take the extra time (which isn’t much) and brown yer butter. I give you the instructions below. As well as an option if you can’t be bothered. Respect. Waffle Irons. I have the glorious Waring Pro Double Waffle Iron. It makes two waffles at a time. Yay. Less time cooking, more time eating. Make sure you have the heat pretty high when making waffles for that nice, crispy exterior. Freezing. Waffles freeze like a dream. Did you know this? Let them cool a beat and then shove them in a plastic resealable bag. Just pop them in the toaster when ready to eat. 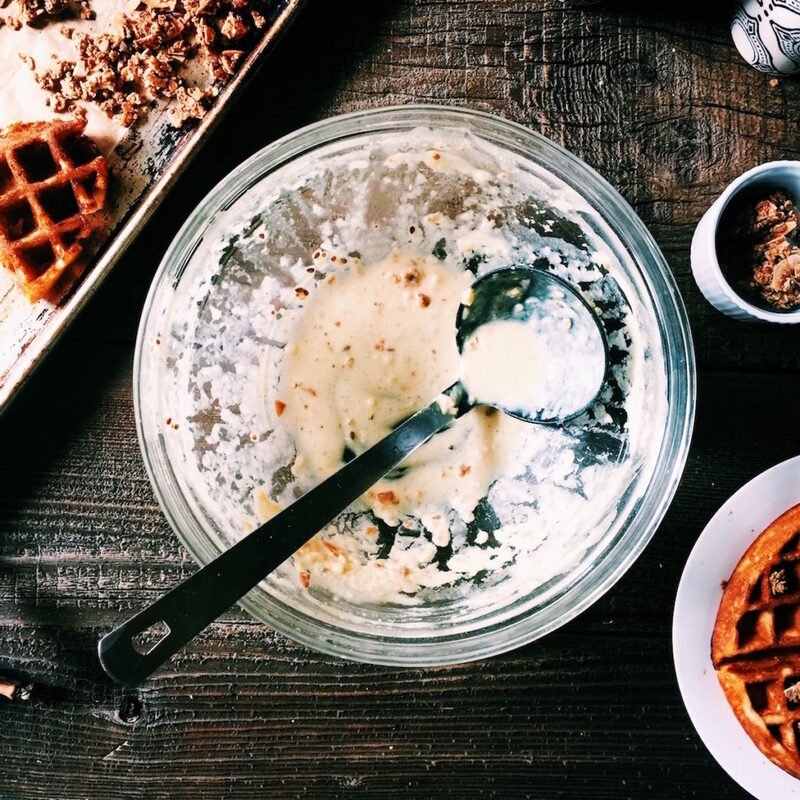 One last note…if you have extra batter and you want granola waffles the next day, just cover tightly, shove in the fridge and use as normal the next day. The batter won’t last longer than that and sometimes it gets this slight grayish tint on the top, but the taste is still what it needs to be. Cover with syrup and proceed as usual. Let’s get our brunch on. To Serve: real maple syrup, granola to spinkle on top + cut bananas. You can either brush your waffle iron with some veggie oil or spray with nonstick (although some say that the latter will gunk up your machine and make it stick more in the long run…you decide). As I’ve gotten to know my waffle iron more, I’ve found that the lightest brush of oil is all it needs in the beginning…they turn our crispier that way. Brown the butter by putting one stick of butter in a small sauce pan and melt over medium heat. Once melted, crank up the heat to medium high. Stand by, stirring and watching. This isn’t the time to go and put your dry ingredients together. Watch yer butter. Small golden bits will start to settle on the bottom of the pan and it will smell nutty. Heaven. Once this happens, take it off the heat and pour into a large bowl to cool a bit. *If you don’t want to brown your butter, you can simply melt it in the microwave or on the stovetop and proceed with the recipe. In a medium bowl, whisk together the all-purpose flour, white whole-wheat flour, baking powder, baking soda, granulated sugar and sea salt. In another medium bowl, whisk together the buttermilk, milk, eggs and vanilla. Once this is well-blended, whisk in the melted butter. Make sure you are constantly whisking so that the heat of the butter doesn’t start cooking the eggs. Throw in the granola and give it one last mix around the bowl. Make sure you break up any super large granola chunks. Don’t overmix…your batter will be lumpy. It’s cool. It will also be thick. Don’t sweat it. 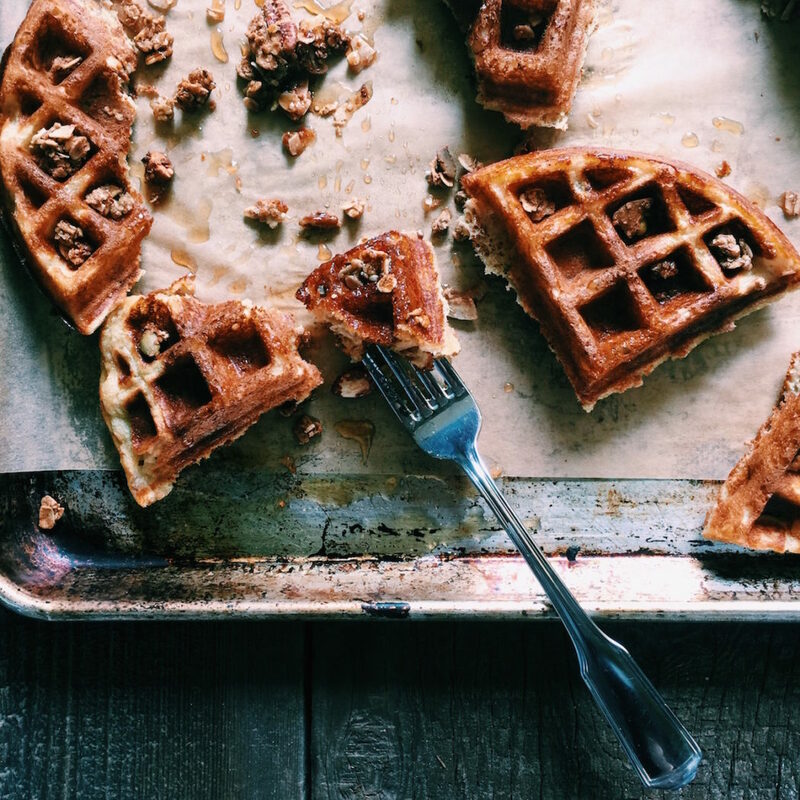 At this point, your waffle iron should be hot and ready to go. But pause a beat. Let your batter hang out a sec. I always think the batter performs better when you let it chill and mingle before it hits the heat. This is the perfect time to mix up a Bloody Mary or pop open some champagne. I’m talking maybe ten minutes. Twenty minutes? If you’re impatient, carry on. 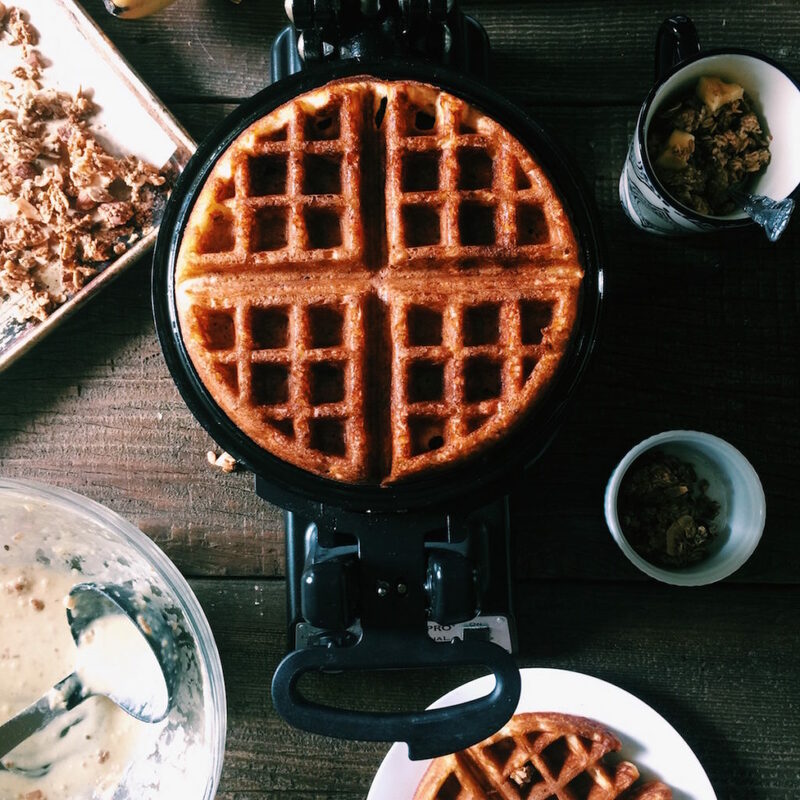 Pour the batter in your waffle iron and set the timer on 3 minutes…you know your waffle maker better than I do. Use that number as a ballpark. It really depends on the size of your waffle iron, how hot it runs, how deep it is, etc. Test it out. Ideally, you serve the waffles as soon as they come out of the waffle iron. They’re best that way. Sprinkle with more granola, chopped banana and maple syrup. Heaven. Because we all know I’m mildly obsessed with Scientology (not as in I want to join, but as in: what the…?!?! )…read this so we’re staying current. I would buy that book today. As in, right this second. I read things like this and watch this and I think, really, we’re still here? Lots of good stuff on the Internet today. Read and think about this. 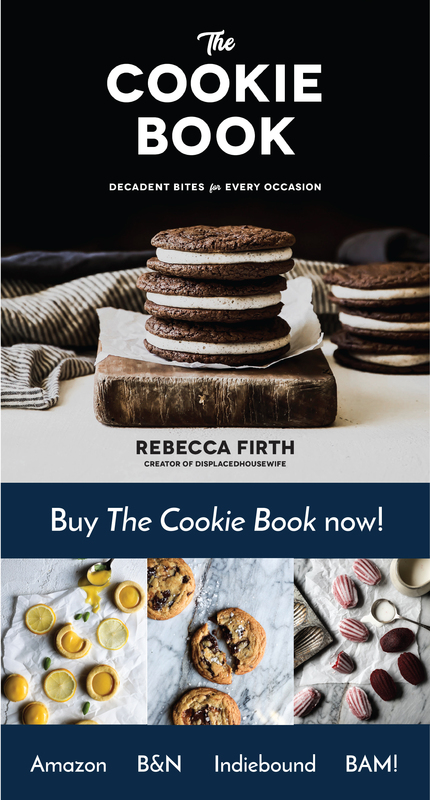 Recent recipes: Chia Cherry Muffins, Fresh Strawberry Cream Scones, Chai-Spiced Granola Oatmeal Cookies, Chai-Spiced Granola, Thai Noodle Salad, Chocolate Rye Stout Cake + Marshmallow Whiskey Meringue, Tart Cherry Almond Scones, Harissa Sliders with Feta-Harissa Secret Sauce, and Brown Butter Muscovado Snickerdoodles. More breakfast: Cherry Almond Scones, Blood Orange Scones, Gingerbread Scones, Cranberry Orange Scones, Maple Oat Scones, Pumpkin Scones, Thai Thai Scones, Bacon, Chive + Cheddar Scones, Raspberry + Blueberry Scones, Double Chocolate-Banana Granola, Cherry-Pecan Granola, Maple-Oat Granola and Fluffy Whole-Wheat Buttermilk Pancakes. I’m going to keep including this info until Hatchery revokes my coupon code! Either click here or on the banner at the top of the page, use the coupon code DHW10 and get your first Hatchery box for $10. I’ve never wanted a waffle more :). These look beyond fab! What?!! Did I hear someone say brown butter? And waffles? In the same sentence? Hold on while I scrape my tongue off the floor. This beauty is really reminding me that I need to get a waffle iron. Then I land back on planet Earth and remember that I live in Boston. . .land of the million dollar shoeboxes. . .and so the waffle iron sits on the back burner. But. . .I’m loving this chai granola. I’m also thinking that me and my waffle iron deprived self could compromise by making up this divine little number. . .but in pancake form. I know. . .I know. . .not the same. . .but what’s a girl to do as long as she lives in a peanut shell? BTW. . .hurray for a wardrobe full of stretchy leggings! Oh my gosh!! These look great, I can’t wait to try the recipe! Ok Rebecca, this is the perfect Mother’s Day breakfast! I think my husband Tom can even handle whipping these up for me. I’ll even make the granola ahead of time for him just so I can get these waffles served up on M Day!! Keeping my fingers crossed! I love your “on my mind” section too. Great idea. Always interesting!